Jesus’ words about the lilies of the field (Mt. 6: 25–33) are among the most quoted of his teachings for their poetic beauty but among the most disregarded for their obvious inapplicability to human life as we know it. This teaching seems to be as inapplicable as Jesus’ invitation to the rich man to give away everything he had and follow him. (Mk. 10: 21) If it is impossible to give everything we have for the Kingdom of God, then it is just as impossible to trust God to feed us like the birds of the air and clothe us like the lilies of the field. However, in reference to the rich man, Jesus said that all things are possible with God, so let us, on this day of thanksgiving, reflect further on the birds of the air. Nature is a system that has a balance to it. Everything is built to provide for other beings. The balance is delicate enough that it can get out of kilter with events such as the plague of locusts the Prophet Joel wrote about. Nature’s balance happens by natural growth as with plants or by instinct as some animals eat plants or prey on other animals. When all is instinct, there is no room for gratitude. In the case of humans, René Girard has shown that there is a whole different system which he calls “mimetic desire.” That is, although humans strive for food out of the same need as the birds of the air, human striving goes beyond these bodily needs. Humans are wired to respond, not just to food itself, but to the desires of other people. This deep connection to the desires of others can lead to generosity and sharing, creating a system of exchange similar to the balance of nature. But mimetic desire can also lead to deadly competition where it becomes important to have more food than other people and more and more things than others. In such a scenario, the desires of others (or the imagined desires of others) drive us to desire way more than we really want or need. This is the system that undergirds the economic system of our world which is driven by acquisitiveness. This system also leads to ecological destruction way beyond what a swarm of locusts can do. If, instead of loving our neighbors, we have to have more than our neighbors, it is not possible to be grateful, because our eyes and hearts are fixed on having more. There is also no room for generosity that would generate thankfulness on the part of others. This is what it means to strive for these things “like the Gentiles.” This is life as we know it. So insidious is competitive acquisitiveness that gift giving can become a system of power plays. This was the way “generosity” worked in the Gentile world in Jesus’ time. The rich and powerful would choose certain people to be their clients. They would provide their clients with many gifts but there were socially understood obligations imposed in the giving of these gifts. This was a system of acquisitiveness like onto our modern system. There was no room for gratitude here either. But God, in Christ, from outside the Gentiles’s system and our modern economic system, gives much more than food and drink. Jesus entered the heart of the primary system of mimetic desire and took on the violence of this system, even to death on the cross. By rising from the dead in the spirit of forgiveness, Jesus opened up a whole new life of the Kingdom made up of generosity and gratitude. The more generosity and gratitude, the less room there is for acquisitiveness and striving for things “like the Gentiles.” There is more for everybody if we don’t always have to have more for the sake of having more. This kind of generosity and cause for gratitude isn’t a human invention, which is why, humanly, it is not possible to be carefree like the birds of the air or the lilies of the field. Jesus embodied true generosity on the cross and in his resurrection as the forgiving victim. Can we respond to this divine generosity with gratitude that unlocks generosity in our own hearts? For more on the theme of generosity, see The Eleventh Commandment and God’s Kingdom in Two Small Coins. For a more extended piece on thanksgiving see Giving Thanks to God. For an introduction to René Girard’s theory of mimetic desire see: Living Stones in the House of the Forgiving Victim. The first verses of today’s Gospel (Lk. 12: 32–34) pick up from where we left off last week. That reading ended with Jesus’ little parable about the rich fool who tore down his barns to build bigger barns (Lk. 12: 12–21) only to find that his life was being demanded of him. This reading begins with Jesus’ soothing admonition to “sell our possessions and give alms” and “make purses for yourselves that do not wear out, an unfailing treasure in heaven, where no thief comes near and no moth destroys.” (Lk. 12: 32-33) This is quite a contrast to two brothers fighting over an inheritance or a rich person gloating over fabulous amounts of wealth. Lest we think Jesus is asking us to make ourselves miserable, Jesus assures us that it is our heavenly Abba’s pleasure to give us a treasure that is the kingdom. If this treasure, the kingdom, is the Abba’s pleasure, then it is our pleasure as well. It is important to see that Jesus is not telling us to give up desires. The heavenly Abba has a profound Desire for a deep union of love with each of us, a union God would have us share with each other. If God is comprised of God’s Desire, than it follows that we creatures are created with desires. What Jesus is doing here is redirecting our desires from the desires of rivalrous avarice towards God’s Desire that is without rivalry. Isn’t every fight, ultimately, over what we think we are entitled to as our inheritance? Yet aren’t we all offered the whole world to be an inheritance rather than a bone for contention? Since these rivalrous desires embroil us with our rivals, the material inheritance we are fighting for is destroyed as if by moths. Of course, each rival blames the other for being the thief that has stolen the treasure. Jesus then shifts to an admonition to be ready for the Master’s “return from the wedding banquet.” (Lk. 12: 36) If we servants are alert and ready to greet the master, the master will wait on us as Jesus waited on his disciples at the Last Supper. 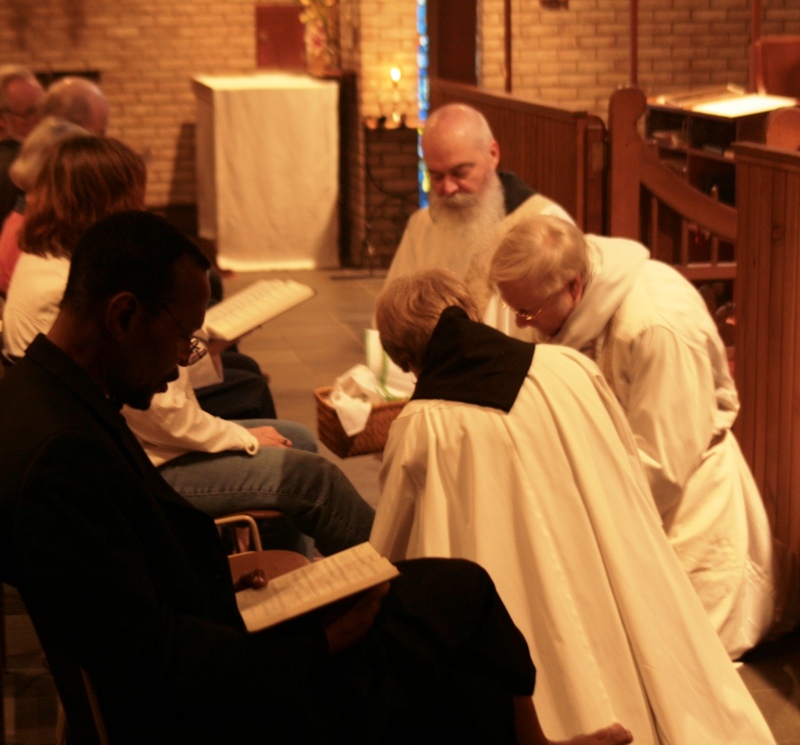 This little feast shared by master and servants is an image of the treasure our hearts should be set on. The progression of vignettes and admonitions throughout this chapter suggests that the best way to be prepared for God’s coming is to set our hearts on treasure that moths cannot consume and thieves cannot steal. Fundamentally, being alert for the “master” consists of serving one another in the same way that the master serves us when he comes. The following little parable is comical and a bit threatening. The master who serves those who wait for him is transformed into a thief breaking into a house in the middle of the night. (Lk. 12: 39–40) If our hearts are not set on the treasure of serving one another, but instead we fight over our inheritance and try to gather it into bigger barns, then the God who serves us will be quite alien to us and will be perceived as a thief, a burglar. If our rivalry deepens as it does in the still more threatening parable that follows, so that our rivalry causes us to “beat the other slaves, men and women, and to eat and drink and get drunk,” (Lk. 12: 45), then the gracious master will indeed rob us of our victims. God is both a burglar and a gracious master who serves. God only breaks in to take away all that draws our hearts away from God and from each other. What this burglar leaves in return is a treasure well worth setting our hearts on. We are so used to passing the collection plate in church that we easily overlook the importance of the collection Paul writes about in 2 Corinthians 8:1-9:15 and elsewhere. The emotion and enthusiasm that gushes from Paul’s pen tells us that the collection was of the upmost importance to him. It behooves us to consider how important it was. Many times, Paul speaks about the joy of giving, not only with money (which Paul had in short supply) but in time and energy and concern for others. It is Paul who passed on Jesus’ words: “It is more blessed to give than to receive” (Acts 20:35) while exhorting the Ephesians to help the weak through hard work. This concern for the weak in Jerusalem is one of the factors that inspired the collection. The joy Paul would have us take in giving is accentuated when we consider that Paul’s word for giving generously and joyfully is hilaritas. That is, we should give with hilarity. Paul shamelessly spurs the Corinthians on to a bit of competitive generosity by boasting of how the Macedonians gave even beyond their means while urgently pleading “for the privilege of sharing in this service to the Lord’s people” (1 Cor. 8:5). Competition has its problems but I don’t think Paul is holding a contest for who could give the most to the collection. Rather, Paul is holding up the Macedonians as an example to follow, hoping that their enthusiasm will inspire a like enthusiasm in Corinth. What Paul is urging is a chain reaction of generosity that will spread throughout the churches. Paul emphasizes the importance of sharing out of abundance, or at least having enough for sustenance, with the hope that such generosity might be reciprocated if the roles were reversed. This is what Paul is getting at in advocating “equality.” In a helpful online article, Sam Marsh suggests that the reason this equality is important to Paul is because he does not want to set up anything resembling a patron-client relationship between the Gentile churches and Jerusalem. The Roman institution of patronage is one of many ways power remained entrenched with those who already had it. Paul is envisioning something very different: a matrix of mutual giving where there is need where everybody takes turns in giving and receiving. The unity of the church also emerges as a principal motivation for the collection. When Paul met with the elders in Jerusalem, as reported in Galatians 2, Paul said he was admonished to remember their poor, which he very much wanted to do. The debate over admitting Gentiles without circumcision was decided Paul’s favor but later correspondence shows much lingering tension over the issue. If the Gentiles of Macedonia, Ephesus and Corinth should send what money they can spare to Jerusalem, it would be a powerful sign of fellowship uniting one church in Christ. Paul’s making sure that representatives other churches accompany him to Jerusalem is another indications of mistrust of Paul in the church of Jerusalem. Most important is the Christological dimension to the collection. Contributing with enthusiastic hilarity is modeled on Jesus who though he was rich, for our sakes became poor that we through his poverty could become rich (1 Cor. 8: 9). This verse has been enshrined in the 1979 Book of Common Prayer in one of the collects for saints who followed the religious life. We can’t help but recall the famous verse in Philippians where Christ humbled himself to enter the human condition and suffer the same vulnerabilities, including death, which humans suffer from. This is a far cry from the billionaire who writes a few tax-deductible charity donations from the comfort of his or her mansion. We can’t compete with Christ in generosity but we can at least empty ourselves of what we do have for the sake of others. Given the eschatological overtones of Paul’s hope for union of Jew and Gentile, this collection may well have had eschatological significance for Paul, not in an otherworldly way, but as a seismic shift in human culture. The Jewish prophets exhorted the rich to give alms to the poor, but this is the first instance in human history that I can think of where a collection of money was taken up for the relief of those in need. Paul started something momentous. It is up for us to finish the job.